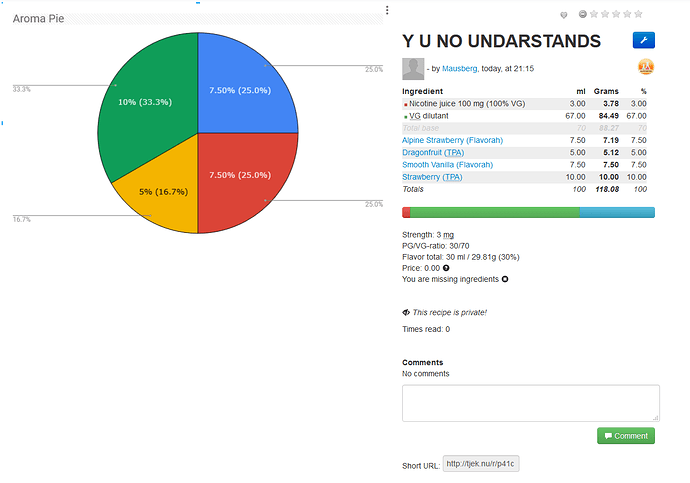 Add a PIE chart to visualize the aroma’s in a recipe. The idea behind this is simple, alot of people have trouble realizing their aroma’s by %. Heck, I still do, and will probably always do. But newcomers are probably more prone to this. Combined with people who can’t or relate badly to numbers. I know theres a bar below the recipe to indicate nic / pg / vg etc. But a pie chart to display the totals of aroma alone. Let’s say I make a recipe with 10% total aroma out of 4 aromas. Then the pie chart would be half purple and so forth. You get what I mean. But yeah, if this is worth the work to implement is one thing, but I think it would be a good way for people to put a slice to their aromas. Maybe even to better see the relation between the aromas in a visual way. TBH I’m not much on the visual aspect… I’m more of a numbers guy. I very seldom use flavors at the full SF %… (unless it’s a soft very delicate top note). This method does vary from mix to mix, but it’s a good starting point for me. Even this method isn’t always accurate, but mixing like this has helped me to layer flavors pretty well when using accurate single flavors. In most cases I can pick out individual flavors when vaped. I’ve started doing something simmilar. Where I divide aromas into what layer group they belong to, and from there I just read my way towards what should be the main driver in each layer and so forth. But like you say, its not always on point. This were a suggestion for making recipe aroma combinations more “hands” on, or visual if you like. I think it would be a good way for new diyers to also look at more experienced mixers concoctions and get a visual aide besides the numbers. Just me thinking out of the top of my head what I would have appreciated if I were a new mixer today. It’s not something urgent, more a convenient QOL thing. We all learn in different ways, and this community is, if anything a great ground for learning and exploring the DIY aspect of vaping. So you mean like dairy, fruits, bakery = red, white blue? No, just a cake diagram of the aromas in a recipe. Or do you mean my way of thinking when mixing a new recipe? This is basicly what I would have displayed on the side of a recipe. But only for aroma in the recipe. To give people a sense of what aromas are heavier on the percentages in a mix than others. I got it now! I’ve seen it as a pie chart previously. Same, think I saw it in an app that I never use. But the idea is compelling, and in some ways I think it could give some a better understanding of a composition of aromas, over just reading a list followed by numbers. A chart like that could get a little weird when mixing flavors… considering the strengths of some flavors. Weaker flavors will be disproportionate to stronger flavors on the chart. Although the WR MF will dominate the aroma, by weight it’ll be only a sliver of the pie. Hmm, did not think of that. But I’m sure there is a way to have a minimum size of a sliver, so that it would not be drowned by the others. Like make them relative to each other with rules. This gives another idea, known extremely strong aromas should have like a notification to them, which also could be present in a pie chart too. Like the sliver has a inverted outline. Ok this is going over board quickly haha intelligent pie chart widget. If all flavors had equal strengths this chart would be easy peasy! Or maybe a aroma meter? Yeah, there’s more ways to display something other than my cake diagram idea lol. Oh, a bottle with a dripper cap, filled up with diff colors representing each aroma… now were talking! 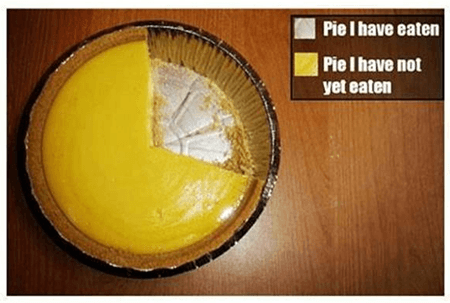 Pie charts are notoriously inaccurate for representing data. Take a complex recipe that has let say 12-ish flavors, and you won’t even see flavors with lower percentages, and if you increase sliver sizes, it wont represent the flavors as it should. It’s not about the accuracy for representation, it’s about just making the relativeness shown, aromawise. There are ways to do this, as there are ways to set a minimum size for a “slice”. It does not really matter what the visual aide would look like. Just as long as its a way to display the aroma usage %'s in a way that is not numbers and lists. While being simple enough for anyone to understand. Example: My blueberry muffin recipe. Where I use 3.5% blueberry muffin (flv) as the main chauffeur. While the rest of the aromas are 1.7 and down. I know there would be a bigger slice of the 3.5% one, over the 0.5% ones. 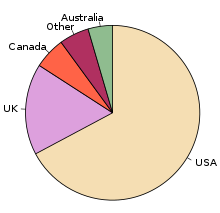 And displaying this with a pie chart, or other means simmilar, is not about accuracy, cause the accuracy is already there, in the lists and %. If instead of using the actual percentage of each flavour you use the relative amount of each flavour, eg 3/4 of the full SF amount for flavour 1, 1/2 flavour 2, 1/4 flavour 3 … Then I guess it could be used as a visual representation of the flavour profile, i.e. give people a quick way of seeing what the mix would taste like. But simply making a chart over the amount of each flavour would imo be completely useless, as the strength of different flavours simply vary too much. Such a chart would tell you nothing about the flavour profile of the mix. I’m open to all suggestions, and some might adhere to the pie, but like @Pro_Vapes said I’m all about the numbers and a full written profile of that flavor by many testers, and take a look see of that flavor used in recipes, than compile that info, into one number % for the recipe I will be making. I get better results and understanding of a flavor by multi-flavor testing, than I do by single flavor testing. I use imagery all the time but somewhat differently. I envision top notes and single flavors as a QR code with the dark area representing the top notes. In the case of a weak or light flavor I know I need to build the flavor. Then I progress to painting in the white areas to round out the recipe. You are at the harbor and have missed the boat, this should in no way be a replacement of how we make our recipes. Just a way to give the aromas a representation visually. And probably does not cater to the experienced mixers in any way. Such a chart would tell you nothing about the flavour profile of the mix. And I do agree, the flavour strength play a huge role in disfavouring something like this. This is meerly a suggestion towards something that could cater for new mixers to ease into the “mindset” of other mixers. And thus learn the buildup of a recipe faster. But there is still no way around learning the aromas the old fashioned way. I see what you’re aiming at, but I still think that a pie chart is useless.